THE LED (OR LIGHT emitting diode) bulb is a relatively new entry to the lighting scene, but one that many say has the power to transform the lighting industry with its energy efficient technology. While even just a few years ago, LEDs were unfavorable to some because of the “cool” blueish light they provided, the LEDs of today offer numerous bulb style and brightness selections, and both warm and cool light options, fueling their growing popularity among homeowners and businesses alike. And with prices that are comparable to CFLs thanks to a 90% price drop in the past five years, it’s no surprise that industry veterans are taking note. While LED bulbs are available in a standard base that fits common household fixtures, there are a few differences and considerations to keep in mind when shopping for your new bulbs. The what? For those of us raised to think about light bulbs in terms of watts, the idea of a lumen may seem a bit foreign. But it’s fast becoming the way to measure the amount of light a bulb gives off. Similar to how more watts used to be the indicator of a brighter bulb (i.e., a 100w bulb is brighter than a 60w bulb), more lumens means a brighter light and fewer lumens means a dimmer light. See how they compare on the chart above. The Lighting Facts Label, now required on all light bulb packaging, provides information about the lumens, life expectancy, warmness or coolness of light, and annual energy costs for that particular bulb, making it easy to compare the options. How do LEDs differ from CFLs and incandescent bulbs? While LEDs and CFLs are similar in the significant energy savings they offer when compared to incandescent bulbs, as well as their ability to be used in standard light fixtures, they differ in key ways as well. The biggest difference is their life span. LED bulbs last six times longer than CFL bulbs (and 50x longer than the old fashioned incandescent bulbs.) They are more durable, the manufacturing process is cleaner and LEDs do not contain toxic Mercury like CFL bulbs—so you do not need to take special precautions with disposal or if a bulb breaks. Further, LEDs are not sensitive to cold temperatures, which means they are great for outside use. And they turn on instantly without need for a warm up period. Talk about an innovation. According to the chart above from Efficiency Maine, LEDs offer an 80% energy saving when compared to the old fashioned incandescent bulbs. And they can be about a third more efficient than CFL bulbs. Considering that lighting our homes made up about 10% of our 2015 energy bills and that the average home in Maine spends $1000/year on electricity, it’s easy to see how quickly the savings can add up. Thanks to advances in technology and design, the prices for LEDs have dropped 90% in the last 5 years, making them in many cases comparable to CFL bulbs. 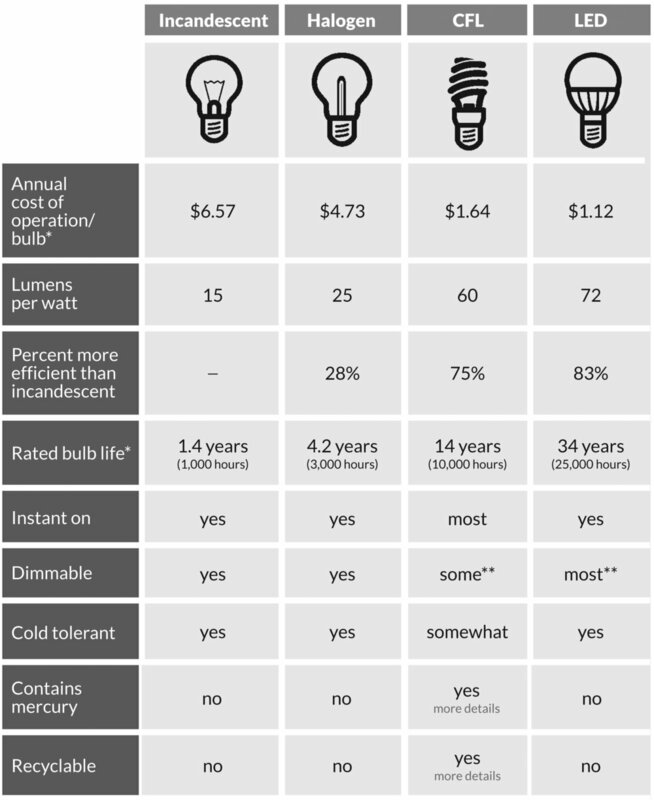 With the instant rebates of $3$5 per bulb offered by Efficiency Maine (and processed by the retailer so you don’t have to), it’s common to find LED bulbs equivalent to 60w bulbs in the $3-$6/bulb range or less. Considering they have a life span of six times longer than CFLs and 50 times longer than incandescent bulbs, it’s easy to see how your cost savings can quickly add up. Whether you are looking to trim a little off your electric bill each month, reduce maintenance on your lighting or shrink your carbon footprint, it may be time to start transitioning your home lighting to LEDs. With these benefits, it’s clear that LEDs are one technology that will be around for a long time. Tip: Efficiency Maine maintains a chart of the current retail prices for LED bulbs across the state, making it easy to find the best deal near you. Find it at www.efficiencymaine.com.